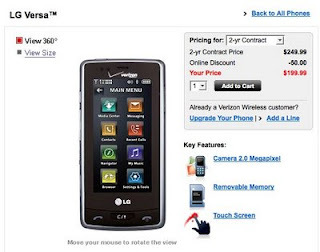 Right on -- well, the predicted -- schedule, LG's unique Versa handset hits Verizon Wireless stores nationwide. We've specced, reviewed, and generally fondled this set enough to give us a pretty warm fuzzy feeling about it and if you've about made up your mind by now, plonk that cash down. Pricing is set at $199 on a two-year, $269 on one-year (both after online $50 rebate), and a whopping $449 if month to month is more your thing. Admittedly, while cool and we're really digging where it fits in the market, it is still a feature set and the off contract price is a bit heavy. If anybody has been dying to get their hands on this phone or picked one up today, do let us know what you think.